Today the #SundaySupper gang teamed up with Beef Checkoff to show you that you can have protein rich foods in every meal. I joined the 30 day Protein Challenge which helps you to get 25 – 30 grams of protein in every meal. Why protein you wonder? Protein helps build muscles, it fills you up, it’s low carb and combining protein with healthy fat helps speeds the metabolism. For my challenge, I was to make a healthy, high protein lunch to help fill you up until dinner. I decided to make one of my favorite sandwiches, which is Beef Gyros. 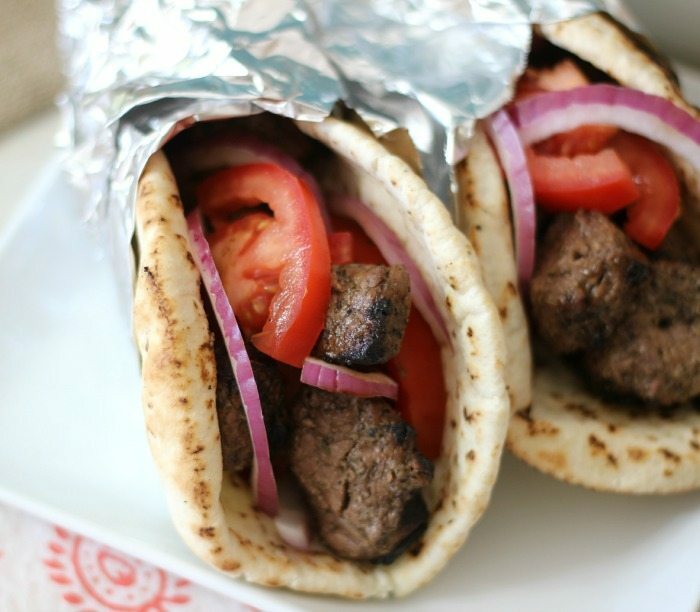 Gyros is pronounced “Gyear-ose”, with the ‘g’ kind of aspirated. I will admit I pronounce it wrong, but that’s ok because I made a killer sandwich and that is all that counts. For the beef I used Steak Tips. I marinated the beef for 4 hours in olive oil, red wine vinegar, lemon juice, garlic oregano and salt & pepper. I skewered it and grilled it for about 4 minutes per side. The meat was perfectly tender and not tough at all. Nothing worse than having a steak sandwich that is chewy and hard to swallow. You won’t have to worry about that in this recipe. 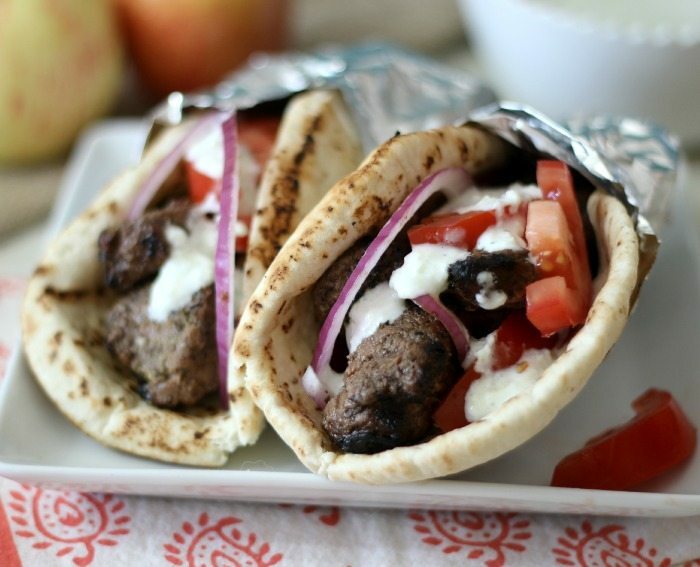 I served my Gyros with tomatoes and onion and drizzled it with an easy cucumber dressing made with greek yogurt. It’s light and refreshing. This sandwich is also light to, it didn’t feel to heavy and it was perfect for lunch. One thing I forgot in this recipe is feta cheese. I bought it, but it slipped my mind. After eating my Gyro I realized I forgot the cheese. That’s ok, because it was so good I actually didn’t miss it. A Protein rich, Greek sandwich made with marinated steak tips, tomatoes, onion and topped with Tzatziki Sauce, which is a cucumber and Greek yogurt dressing. In a bowl, add garlic, lemon juice, red wine vinegar, olive oil, oregano, salt and pepper, mix until combined. Add meat to a zip top bag or bowl, and pour marinade over the beef. Refrigerate for 1 hour up to 4 hours. Set grill to medium low heat, you can place meat on a skewer or place directly onto grill grates. Cook each side for about 4 minutes. Let the meat rest for 5 minutes. 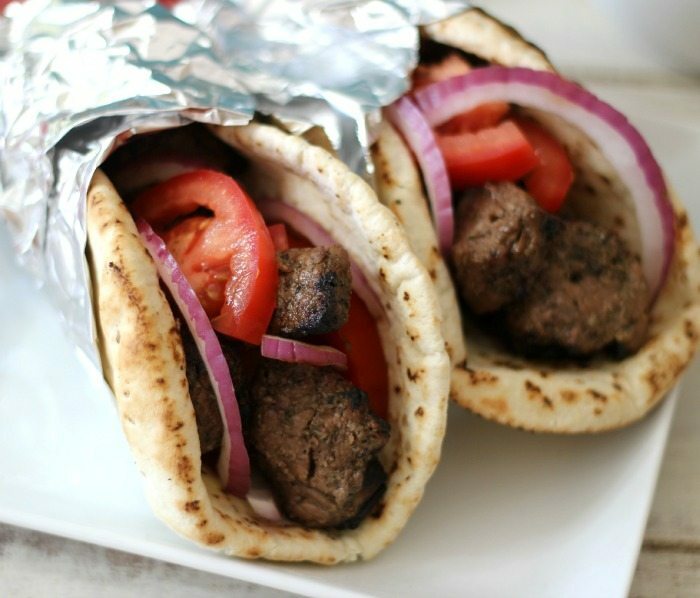 Evenly divide the meat on a pita shell, top with tomatoes, onions, feta cheese and serve with Tzatziki Sauce. For Tzatziki Sauce: In a food processor or blender, add the cucumber and half of the yogurt, process until well blended. Add mixture to a bowl and stir in remaining yogurt, dill, lemon juice, garlic salt and pepper. Add additional salt, if needed. Refrigerate until ready to use. I hope you will join me in the 30 day Protein Challenge! It’s a great way to get your protein in and it can help you to lose weight or maintain your weight. To get more information, you can go here. Looking for more Protein packed recipes? You can check out our Pinterest board. You will find great recipe, beautiful photos and get ideas to make your own protein rich foods. Just go here to check it out! I hope you have a great rest of the weekend! See you tonight at 7pm (EST) for the #SundaySupper and Beef Checkoff Twitter party. Just use hashtag #SundaySupper. These sound great with or without the feta! I have a teenager that NEVER gets full. This might actually do the trick!! Yum! One of my favorites! 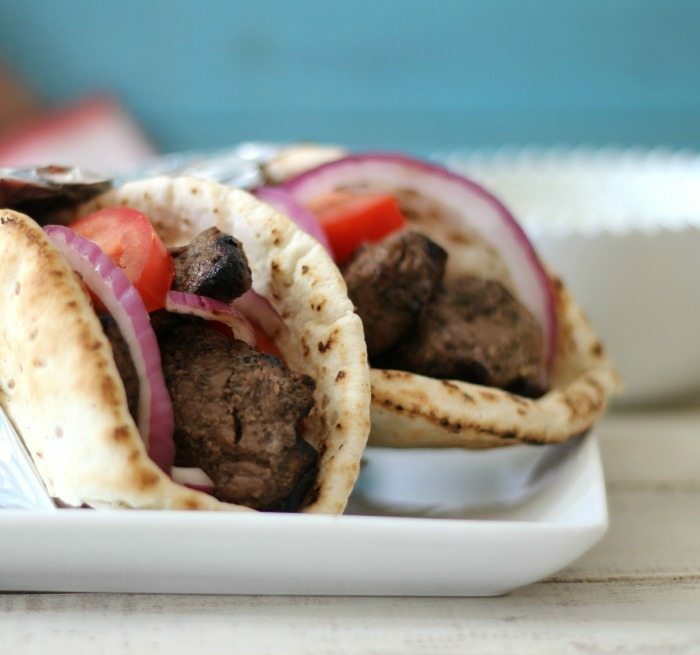 Love Beef Gyros! 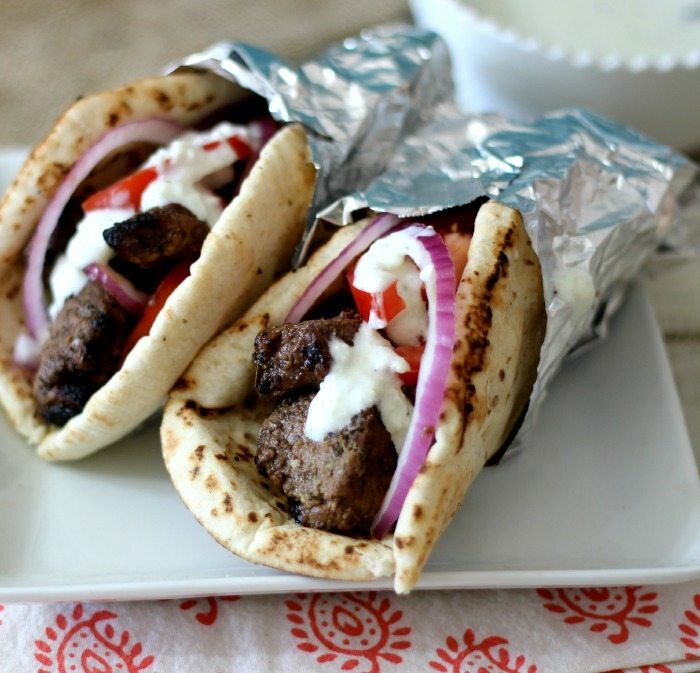 I’m always drawn to gyros…I think it’s the sauce. But the marinade you used on the beef is simple perfection. I don’t care how you pronounce it, I want one! Oh yes please!! i ❤ GYROS!! craving for beef and I know where to find my recipe. thanks for this!